The Daisy Flower Has An Amazing Secret. Now That's Clever. The Daisy Flower. A Very Clever Survivor. A Creamy Yellow Daisy Flower. The Daisy Flower reminds me of fields and meadows, daisy chains, and 'he loves me, he loves me not'. We had no daisies way back then, so we used Clover flowers for a beautiful daisy chain. 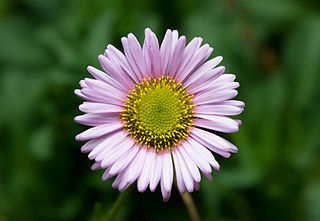 My favourite true daisy is the pale pink Marguerite, and the other is the beautiful Aster. Cosmos Flowers also belong to the Daisy Family. Daisies belong to probably the largest family of flowering plants - Asteraceae - which has around 23,000 species. Some types are Annuals eg. the English Daisy and some are Perennials eg. the Shasta Daisy and the Coneflower. 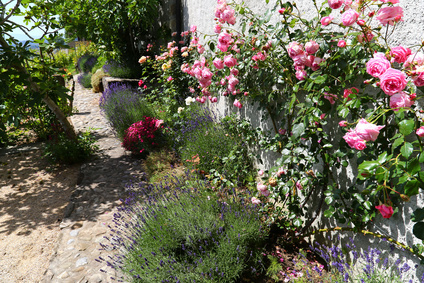 My ideal garden would have both. The Simple, Elegant Aster Flower. Some daisies are delicate and some are tough. Even the common Dahlias, Chrysanthemums, Gerberas and Calendulas belong to the same family. Evolution: They have been around since 42 - 36 millon years ago, but their direct ancestor may have been here for up to 49 million years. The Daisy Flower's symbolic meaning is 'childhood, innocence and purity'. So the Everlasting Daisy would mean holding onto all of these qualities for all your life - forever. The dry, papery petals on the Everlasting (or Strawflower), last 'forever', and are always available as a dried arrangement in a vase. To see a 47 million year old daisy fossil click right here. The daisy is mainly herbaceous - lacking a woody stem - but there are also some shrubs, trees and even climbers (now that would be nice) with woody stems. Daisy plants mostly have a tap root but others may have fibrous roots. Which means some are Monocots whilst others are Dicots. Their stems are usually erect but then again some can be spreading in their habit or even climbing. I think there is a type of daisy for just about everyone. Daisies may mean innocence and purity but they can also mean durable because they are generally so tough. The original meaning of the word Daisy comes from Day's Eye - they open during the day and close up at night. Our daisies outside have just closed for the night. Now I wonder why they do that? Actually, it's to conserve precious energy for tomorrow. 'Marguerite' is the French word for daisy. Daisies were once used to treat grey hair and return it to its original colour. Now that would be similar to the idea that if you get sufficient minerals (as from the sea) your hair will not go grey at all. As if! Old saying: 'Spring has not come until you can set your foot on twelve daisies'. One thing I can say about the daisy flower: it certainly is cheerful. Utter Perfection. The Pink Marguerite. My Favourite. Scientists are not sure why the daisy flower became so successful. But it may be because they developed a highly specialized Capitulum - a special type of flower head - or because they can store a constant supply of energy such as fructans (like fructose). Or was it a combination of these and other factors? (My guess is that it's both). When you see their true intricate nature it's no wonder they did so well. Especially when you find out the number of seeds they produce. The daisy flower consists of a compact mass of very tiny stalkless flowers (the capitulum), as in the English Daisy. The yellow central portion of the capitulum of a daisy consists of 'disk florets' while the outer white, petal-like structures are called 'ray florets'. Each ring of petals or sepals or florets are called 'whorls', as in most flowers. 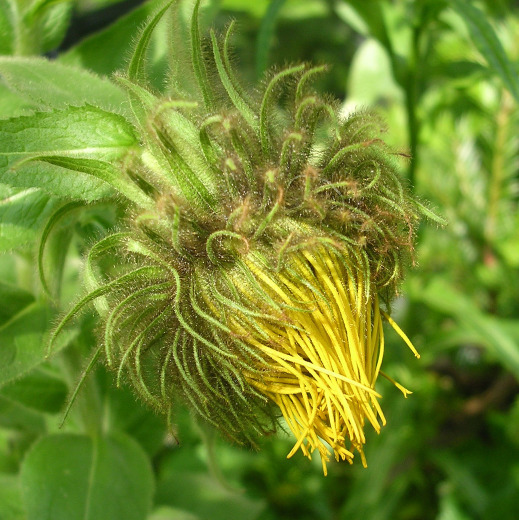 The specialized capitulum (or flower head) is shared by all flowers in the family Asteraceae. This amazing type of head consists of many individual flowers which mature into seeds, often in the thousands. If you meet this term when studying flowers, it simply means 'a flower cluster' or a group of flowers on the same stem. They often have special characteristics which is very evident in the Daisy Flower. Bellis perennis. The English Daisy. But there is only one true daisy flower, the English Daisy, Bellis perennis. Many daisies are beautiful and more popular but nothing really compares with Bellis perennis. However, it is a matter of personal choice. 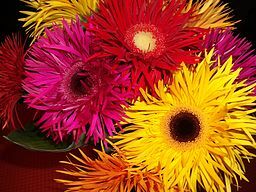 When I was confronted with the Gerbera daisy, I was stunned. 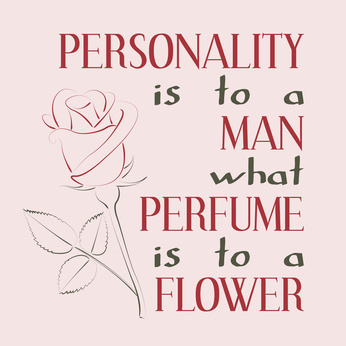 Where is the stigma, the style, the ovary and where are the stamens? After searching for information to answer these questions, I discovered their secret, and that goes for all the other daisies too. They don't have just one stigma, one style, or one ovary; they have hundreds - each intricately placed in the capitulum (flower head) - to ensure thousands of seeds so that reproduction is a certainty. This species is not going extinct for a long time yet. The Magic of the Daisy Flower. A Composite Type. 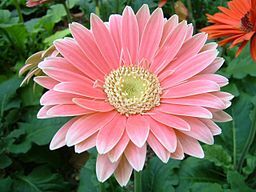 You see, when you look at a Gerbera daisy or an ordinary daisy flower, what you are actually seeing is not a single flower, but a whole combination of individual flowers arranged around a central Disk. (A composite of separate individual flowers all borne, not on just one bush, but on every single flower on every bush). All of those little flowers are called Florets. Florets closest to the centre are called the 'Disk Florets' and those on the outer edge are the 'Ray Florets'. Each one is a perfect tiny flower and is capable of being fertilized, and that's why daisies have so many seeds - thousands- each daisy capable of producing up to 26,000 seeds per plant, depending on its size and the number of flowers on the plant. So the daisy flower is called a 'composite' flower. Smaller daisies may 'only' manage a thousand or two seeds. As with the wild roses, daisy flowers can be considered pests, depending on where you live. The Gerbera daisies are very special as you will soon find out. They are bigger and more showy, therefore their individual parts are more readily identified. A whole new world opens up under the microscope. This has to be seen to be believed. The Secret of the Gerbera Daisy and all the others. Traditional pale pink Gerbera. Photo Credit: Sakurai Midori. A little more modern. Mutant Gerberas. Photo Credit: Paebi. 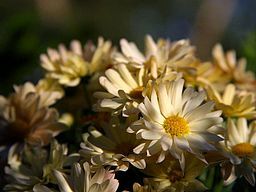 The Chrysanthemum is another type of Daisy flower. It is used in Australia for Mothers' Day because it is always in flower at that very special time of year (early Autumn). Different countries have their own unique flowers for Mothers around the world. There are three more members of the daisy flower family which are my favourites: The Aster Daisy, the Seaside Daisy and the Paper Daisy (or Everlasting Daisy). Blue Aster Alpinus. Photo Credit: BotBin. The Asters - Asteraceae family - come from the Greek word meaning star. They are popular because of their many varieties of colour. They are very tough and can live almost anywhere. There are two native asters in the UK: Goldilocks, which is very rare, and the Sea Aster. 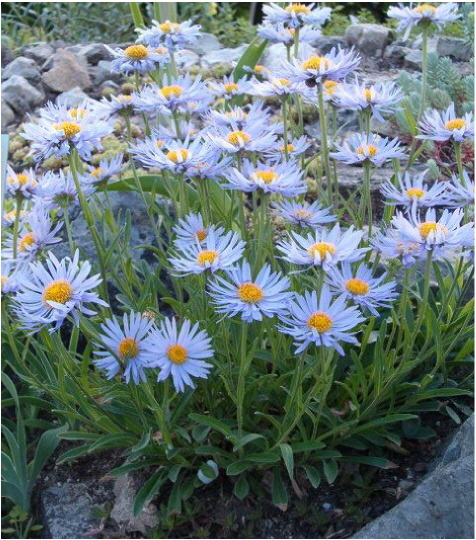 Aster alpinus is another aster daisy native to North America. The delicate Seaside Daisy. Exactly as I remember it. 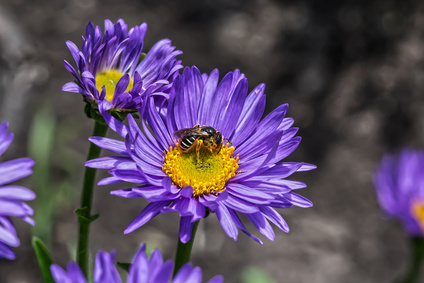 Erigeron glaucus is a species of flowering plant in the daisy family known by the common name seaside fleabane, beach aster, or seaside daisy. I have grown this beauty. It has small flowers, always seems to be in flower and is very tough. A must if you love daisies. With reference to this beautiful Seaside daisy flower, which grows madly here in Australia, I have always known them to be covered in varying shades of pink. They remind me of the Fairy Rose which always seems to have flowers on the bush in different stages of pink. Beautiful for daisy lovers. This has to be your number one plant for year round flowering. 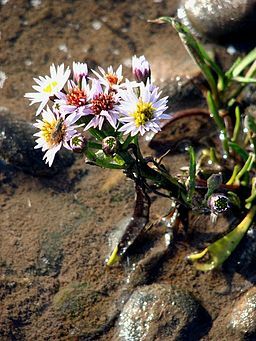 The Sea Aster - Aster tripolium - is a plant of northern Europe that is confined to salt marshes, estuaries and occasionally to inland salt works. (A perfect example of different colours on the same bush). If you are into edible flowers, you may just like this recipe: 'Buttered Sea Aster'. Combine it with a couple of crabs and it would make a delicious seafood meal. Now I'd love to try that! The Sea Aster grows up to 50cm tall with fleshy leaves and purple ray florets (the outside layer of the capitulum - special flower head). They flower from Summer through to Autumn but they tend to be short-lived. So this is where the special capitulum comes in handy - each of the ray florets is a separate complete flower - so the plant produces thousands of seeds before it dies. There are 'rayed' as well as 'rayless' types (Sea Asters), but it is the rayed type which have long blue or white florets. The rayless form is white. They are a wonderful source of energy for the late butterflies such as the 'Painted Lady' and the 'Red Admiral'. 'Strawburst Yellow' (above) bred in California. The Paper Daisy ( Xerochrysum bracteatum). The Strawflower. This beauty is commonly known as the golden everlasting. 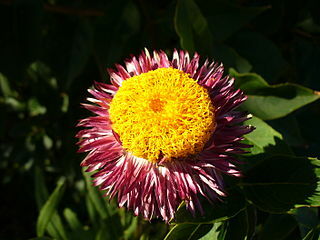 It is a flowering plant in the family Asteraceae native to Australia. Everlastings feel just like stiff paper and come in many delightful colours. 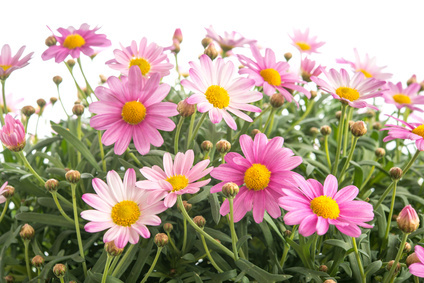 As you can imagine, they last 'forever' as cut daisy flowers and provide a riot of colour in any garden. They are also called Strawflowers. The Paper Daisy occurs in all Australian mainland states and territories as well as Tasmania. But it has even been reported growing in disturbed soil, along roadsides and in fields in the New England region in the United States. Dargan Hill Monarch Everlasting. SE Queensland. Australia. 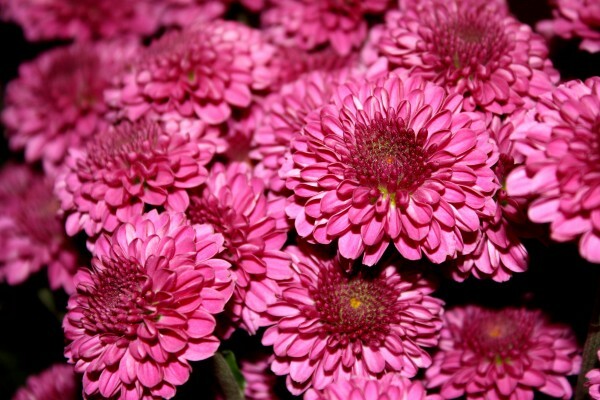 A pink everlasting hybrid daisy. An orange-red cultivar (cultivated variety) everlasting daisy flower. Not all daises are equal. Home. Return from the Daisy Flower to Types of Flowers.